Jump to the other end of the binoculars, look "backwards" through the 100 mm objective lenses and you'll notice the barrels' interiors are well knurled. Small raised rings down the length of the tubes act as light diffusers, baffling the prisms from late-arriving rays, reducing scattered light, which can compromise your image. And the images these big eyes can pass are astounding. I like trying to pick out clusters of galaxies in large binoculars, like springtime's Leo Triplets (they aren't really siblings). But just to manage expectations, some of the best galaxy groups are too faint and faraway for even big binoculars, like autumn's Stephan's Quintet (they don't really play music, anyway). With two eyes on the target, the distractions of Earth can melt away. Some of those galaxies are interacting; 400 billion or more stars, each pulling on all the others with their omnidirectional gravitational tractor beams. And it's brain-boggling to remember you're looking at structures that are tens of millions of light-years away. Your high-contrast 25x100s are an immersive space-time machine. Given that the view is upright and not reversed left-to-right (as happens with many telescopes) you can enjoy your bodacious binocular rig during the day. Try watching skiers carve virgin snow early in the morning on a distant mountainside, or sailboat races from the comfort of your beverage-cradling deck chair on land. These SkyMasters have the word "Waterproof" printed on them, though the rubble-y metallic finish won't give you immediate confidence in that claim. [Celestron's online specifications for the 25x100s only declare "water resistant."] We expected a rubber coating. The rough metal does bestow a sense of non-slip security when hand holding or pointing your rig. At the typical temperatures of night-sky observing, the surface feels quite cold to the touch. That's actually a good thing. 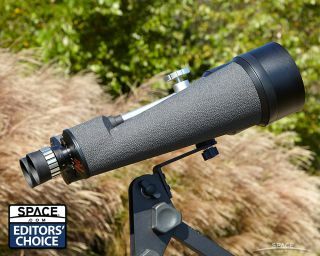 It suggests these Celestrons will "equilibrate" (cool) to ambient temperature faster than better-insulated binoculars. This isn't as big a deal as it is with telescopes, especially mirrored ones (Newtonians and Cassegrains), but it's nice for all your optical surfaces to maintain their relative geometries. We were a little let down at the way Celestron ships these instruments. For the price-point, we expected a solid, lined shock-resistant case. Instead the 25x100s come swaddled in a thinly padded fabric binocular "cozy," which slips into an even thinner nylon soft pack with a shoulder strap. There’s a thin elastic strap that’s supposed to restrain the mass. But it's too easy for the heavy binoculars to slip out of the "cozy" and onto the hard ground. The documentation shipping with the 25x100s is also a little disappointing. It's just the generic Celestron SkyMaster one-pager. A lot of the information applies only to the smaller members of the SkyMaster line. These big guys, for example, have no center-focus knob; you set the eyepieces independently. Also, there's no inter-pupil distance (IPD) scale; it would be next to useless in the dark anyway. Besides, large astronomy binoculars tend to be personal items; you'll set your IPD — and likely, the focus too (at infinity) — the first time you use them. Thereafter, you'll seldom do more than tweak these back to your custom settings. Finally, the floppy rubber objective lens covers really don't want to stay put. They will dive off the tubes and steal away into the night at their first opportunity. Don't ever let them get the drop on you. Despite these few cost-saving (read: profit-retaining) skimps, these Celestron Skymaster 25x100 binoculars were still our favorites for large astronomy binoculars. With proper care, they could give you decades of joyful stereoscopic star-hopping. Celestron SkyMaster 25x100 can only be used on a tripod or counterweighted arm. Here, the author scans for the moon in daylight. 100 mm objective diameter: The large lenses on the front measure 100 mm across. 156-ounce mass: These binoculars weigh 9 lbs, 12 oz — more than BOTH of my children at birth combined. 3-degree field of view: Big astronomy binoculars won't be very wide, but objects on the sky don't move (much). 157-foot aspect width (48 meters) at 1,000 yards (914 feet): Another way to visualize Field of View: Wider gives you more of a "spacewalk" experience. 4mm exit pupil: Bigger is better: Ideally, larger than the diameter of your dark-adapted eye’s pupil (varies with age). $300 street price: You should expect to pay about $300 (+ shipping) after some comparative shopping. Before buying big binoculars like these, think carefully about what kind of sky you have access to. Optical physics imposes a cruel reality on us: The higher the power, the dimmer the image. Large telescopes bring objects in "closer" but at a cost: An object's photon-per-time count may fall below the human-made light scattering the sky. The rods and cones of your eye may not get enough stimulation to tell your brain a good story. Light pollution is the bane of amateur astronomers. If you live near a bright city – and can’t over the hills and far away – you may be better off with lower-power, smaller, brighter binoculars. But if you can get away, get dark, and get a comfortable tripod or arm mount, the Celestron SkyMaster 25x100 binoculars can deliver a personal universe of startling complexity. And beauty.